Santiago Solari praised Marco Asensio's performance despite the midfielder's profligacy leaving Real Madrid exposed to a nervy finish in the win over Rayo Vallecano. Karim Benzema's first goal in six games secured a valuable 1-0 win but sections of the Santiago Bernabeu were unimpressed with the showing. Thibaut Courtois, a spectator for much of the match, was required to make a fine double save at the death and the home fans, angered by the midweek Champions League loss to CSKA Moscow, greeted full-time with whistles. Spain international Asensio earlier squandered two good opportunities yet Solari insisted he had no issue with either the 22-year-old or the crowd's reaction to the result. "I was delighted with the support of the fans through the whole game. There was that last chance and that's football," the Los Blancos boss told reporters. "Asensio was very active. He worked hard in defence and all over the whole front line. "That is the Asensio we all want to see. I like his game a lot. He must keep trying as the ball will go in for him." Asensio was withdrawn in the 70th minute as he finished a frustrating outing with ice strapped to his thigh. Benzema joined him on the bench after appearing to hurt his ankle late in proceedings, the pair now both in doubt for Wednesday's Club World Cup semi-final clash with Kashima Antlers in the United Arab Emirates. "I think it's a knock but nothing more [for Benzema]. 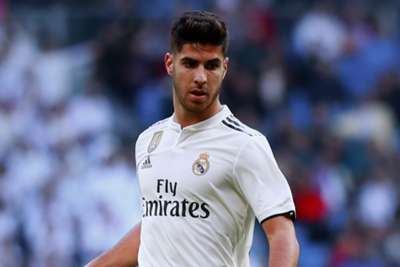 Asensio also had a knock," Solari said. "We'll assess them tomorrow on the plane because we do not have more time."